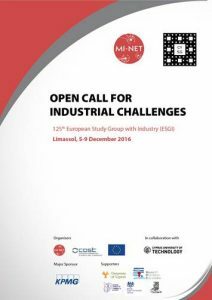 We have now opened our online registration form for companies to the 125th European Study Group with Industry (1st CY Study Group), taking place in Limassol, 5-9 December 2016 (Venue: Cyprus University of Technology and Poseidonia Beach Hotel). If you are a company (or other organisation) and have a challenging problem to be solved by our team of expert participants please submit your proposal by the 24/10/2016. You may download the invitation with all relevant information from below.